This article describes the concept of the Bowman Strategy Clock in a practical way. After reading you will understand the definition and basics of this powerful strategy positioning tool. What is the Bowman Strategy Clock? It’s a good idea for companies to gather information on their market position in relation to their competitors. The Bowman Strategy Clock is a marketing model with which a company can analyse its position in relation to what its competitors have to offer. It was developed by economists Cliff Bowman and David Faulkner. According to Bowman, competitive advantage is more powerful as a distinctive element than a cost advantage; it concerns strategic positioning and the positioning of a product in the market. 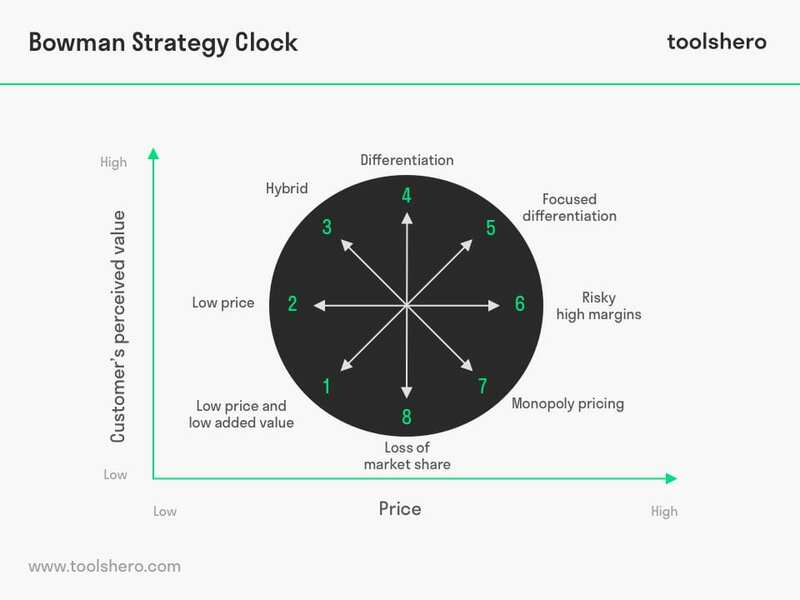 Bowman’s Strategy Clock shows how a company can position a product or service based on two dimensions. On the one hand, it’s about price and on the other it’s about perceived value. Looking at the different combinations of these two dimensions within the Bowman Strategy Clock leads to eight possible strategies, divided over four quadrants. These eight strategies are displayed in a clock, which this model’s name is based on. A company can choose a position form the Bowman Strategy Clock which offers the most competitive advantage. If a company understands these eight fundamental strategic positions, it will enable them to better analyse and evaluate its current strategy. From this position, it can make changes and improve its competitive position. This is not the most competitive position within the Bowman Strategy Clock. The product or service is not differentiated and the customer perceives very little value. The price is still very low. Actually keeping the price low is the only competitive method the company can use to compete with other suppliers. Companies in this position often produce large quantities. Their products are valued. Products are sold at a low price which leads to low profit margins on individual products. The high volume of output can still generate high profits. This position regards cheaper market leaders that focus on cost minimisation; cheap and fast production and using economies of scale. Possible price wars are often fought at this position. On the one hand, this position involves companies which use product differentiation. Therefore, it’s products are highly valued. On the other hand, the companies focus on a low price. The customer is convinced there is a good added value which genuinely benefits them. This position of the Bowman Strategy Clock is very effective, particularly if the added value is consistently and well-applied and offered. Companies using this differentiation strategy do their best to offer a as high as possible quality at an average price. They wish to offer their customers the highest level of perceived added value. They not only focus on product quality, but also on so-called branding; putting a significant and reliable brand on the market that retains customers. Customers remain sensitive to high quality products of a well known brand and therefore select these products. They are even prepared to pay more for these. This concerns the positioning strategy on which luxury and exclusive brands focus; a high quality product at a high price. They use targeted segmentation, promotion and distribution, which leads to higher profit margins. Their competitors are in the same segment, therefore they keep each others prices high. Companies using this strategy charge high prices for products of which the customer’s perceived value is mediocre. In the long-term, this is a significant risk and this position is likely to fail. Ultimately, the customers will cut their losses and look for a better-quality product in the same price range or a similar product for a lower price. The strength of companies that position themselves as a monopoly in the market is that they are the only business offering the product in their segment. Because of that, they do not have to fear the competition and they are the only one determining the price. The only choice customers have is whether to buy the product or not. The customer is basically dependent on the products or services the monopolist offers. Usually, monopolies are regulated in most countries, in order to prevent the companies from increasing the prices unnecessarily or offering faulty goods. This is not a very enviable position for any company. It means that the company is not able to offer a product or service that the customers value. Furthermore, the price is too high and as a result customers stay away. Often, companies in this segment opt for a standard price for their products in order to still be somewhat competitive. Of the different positions in the Bowman Strategic Clock, three are not competitive. It concerns positions 6, 7 and 8, where the price is greater than the customer’s perceived value. Companies in one of these positions should either lower the price or change the product in such a manner that the perceived value increases. If all of this is not possible, it would be better if they withdrew from the market. Nevertheless, there will always be competitors that offer a higher perceived value for a lower price. What do you think? What is your experience with the Bowman Strategic Clock? Do you recognize the practical explanation or do you have more additions? What are your success factors for good strategic planning and strategic positioning of products and services? Bowman, C. (2008). The Bowman’s strategic clock and hybrid competitive strategies. McGraw-Hill. Carlisle, Y. M., & Faulkner, D. O. (2005). The strategy of reputation. Strategic Change, 14(8), 413-422. Shakhshir, G. (2014). Positioning strategies development. The Annals Of The University Of Oradea, 977, 416-437.